In today’s digital world, kerning refers to the addition or reduction of space between two characters (or glyphs, to be typographically precise). 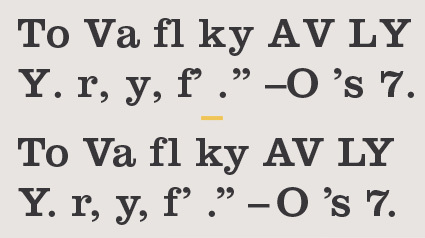 Characters being kerned are referred to as a kern pair, and the amount of kerning can have either a negative or a positive value. Built-in kerning is key to the design of a typeface, due to the variety of shapes in our alphabet and how they combine. The historical meaning of kern is somewhat different from the digital sense. The kern is the part of a piece of metal type that overhangs beyond the body (the ‘shank’) so that it can rest on the body of an adjacent character, allowing for tighter spacing and better letterfit. Although kerning originally described the cutting away of the body of the metal type, to kern metal type came to mean the removing of space between two characters as described above. A professional-quality font comes with built-in kern pairs. These can number in the hundreds, or even thousands for an OpenType font with an expanded character complement. 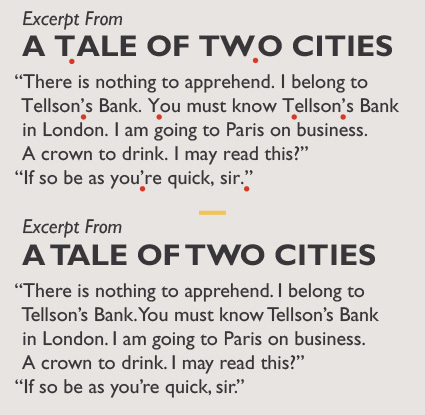 Some commonly provided kern pairs include caps to lowercase; characters to punctuation and word spaces (yes, you can kern a character to a word space); and double punctuation, such as a period followed by a closed quote. Since it is impractical to do a lot of manual kerning for lengthy text, as is often done for display type, it is crucial to work with fonts that have even, balanced overall spacing, requiring minimal manual kerning. Today’s design software provides the user with two different options for kerning type automatically – as differentiated from the commonly-used feature that allows for manual kerning between two characters. Many typesetting programs have two global settings that can be applied to selected text: metrics and optical. Metrics, which is the default setting, applies the font’s built-in kerning established by the typeface designer and/or foundry. The optical setting discards the built-in kerning information, and instead uses an algorithm to respace and kern the type. In general, when using a professional-quality font, it is preferable to use the metrics setting, maintaining the spacing and kerning determined by the designer. If you find yourself working with a font that (for whatever reason) has uneven or poor overall spacing, the optical setting can be useful in an effort to improve letterfit throughout. If the type remains uneven/unbalanced and therefore unsatisfactory, it might be prudent to consider using another typeface with better built-in kerning that doesn’t require a lot of manual intervention. The many differences between an unkerned setting (upper) and one that has been kerned (lower) can clearly be seen here. Metal type with kerns makes all the difference in the spacing between certain character pairs, such as ‘rf’, ‘fe’, and ‘ct’ (lower). Photographs courtesy of Lead Graffiti. The upper setting shows a selection of characters that commonly require kerning, with the built-in kerns turned off. The spacing is much more pleasing when the kerning is applied. The red dots indicate the troublesome character combinations that usually call for kerning (upper). When kerning is applied, overall color and texture, as well as readability, are greatly improved (lower).